It’s a variation of Masala Vadai. More healthy and tasty evening snack. Spinach adds the extra nutrition. As mentioned in my earlier posts, spinach comes out at the top of the ranking list for nutrient richness. Rich in vitamins and minerals, it is also concentrated in health-promoting phytonutrients such as carotenoids (beta-carotene, lutein, and zeaxanthin) and flavonoids to provide you with powerful antioxidant protection. Soak the channa dhal in water for about one to two hours. Drain the water well and add this in to a blender jar and coarsely grind it and transfer this ground dhal on to a bowl. With this mixture add chopped spinach, onion, green chillies, ginger, fennel seeds, asafetida, a teaspoon of oil and salt. Mix well by squeezing the spinach with hand. 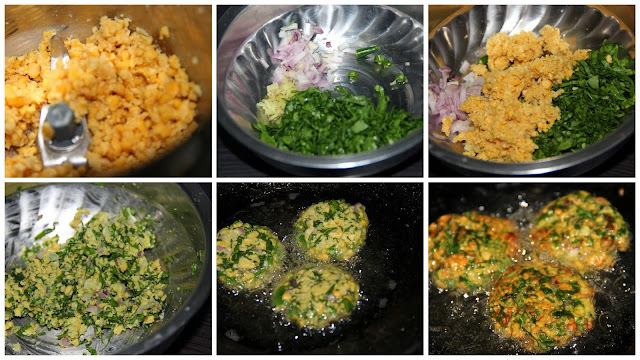 Take a big gooseberry sized ball and pat into vadas by shaping using your left hand palm and right hand fingers. Heat the oil and deep fry this in medium low flame till crispy and golden on outside. Note: You could add a pinch of baking powder to the mixture for the lasting crispiness. Healthy twist to the traditional vadai. Loved it.